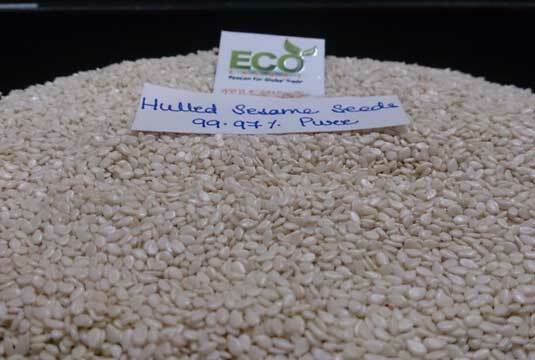 Eco Export offers Hulled Sesame Seed processed with hi-tech machines in most hygienic conditions. Our hi-tech process preserves all the natural richness and flavors of the seed. Hulled sesame seed has wider application in topping for Hamburger buns. This product is also used in bakery and confectionery industries. We supply Hulled Sesame Seeds in quality packaging to protect from sunlight, dust, and water, thus ensuring longer shelf life. Hulled Sesame Seeds also has an application for creamy sweet wholesome paste called Tahini. They are rich in Iron, Proteins, Calcium, Potassium, Phosphorous, and Vitamin B & E. They also neither contain two rare amino acids nor present in vegetable proteins. All these beneficial properties add up to make them a single & wholesome source of health.